Monastic practices and structures in the early Church were very different from what they are today where considerable divergences have developed in practice and organization. In the early Church, monasteries played a much more important role with abbots regarded as de facto leaders of the Church. The Order of the Most Holy Mary Theotokos is a religious community, a monastic order, and a “monastery without walls”. Yes, we are indeed all of these things. Yet we are much more. O.SS.T is an independent Catholic jurisdiction in the tradition of the Old Catholic Church. Maintaining simplicity, we are neither institutionalized nor bureaucratic. Given our monastic orientation, we appreciate God through the eyes of the early Church rather than an institutional church. As "Benedictines of Mary, Old Catholic Marianists" we are a religious congregation of brothers, sisters, and priests within the Catholic faith tradition. All the members share a vibrant community life and offer their gifts and talents, in the spirit of Mary, to the Church. From our founding, men and women of different levels of skill and professionalism have become members. Our priests live and work together with the sisters and brothers as equals. As a Marianist Order we try to live as Mary, the person of faith, who said "yes" to the Lord in her own life and shares Jesus concern for his brothers and sisters. "Do whatever He tells you" she told the servants at Cana (John 2:5). The Order of the Most Holy Mary Theotokos is a community whose heart honors the past, but whose eyes are fixed on the future. We are an Independent/Autocephalous Catholic ecumenical religious order and jurisdiction, rooted in the ancient, yet reaching for tomorrow. It has been said that O.SS.T. is "an ancient religious community with a modern perspective." As "Benedictines of Mary, Old Catholic Marianists", we are fully Catholic in faith and tradition and share historical roots and a common appreciation of liturgical rites and religious practices with other Catholic, Orthodox, and Anglican churches. One might rightly consider our faith community as an "atmosphere of ecumenical grace", embracing all Christian believers and the un-churched, aiding them in their journey to God. Many people today are being led by the Holy Spirit to discover a new way to Jesus Christ. The insistent emergence of those who feel called to the religious life, while maintaining a family and professional life, dictate that we bring about revolutionary methods of integrating the fundamental principles of contemplative spirituality into our modern lives whether our vocation finds us on Wall Street, on Main Street, or down on the farm. For hundreds of years, monastic walls defined religious life. Today, walls continue to help define religious life, however, now there is a difference. They are invisible. The Order of the Most Holy Mary Theotokos believes that walls serve an important and useful function. They have a utilitarian purpose; they provide shelter, safety, and lodging. However, walls of rock and mortar have the capacity to limit our experiences and walls without heart or spirit are nothing more than human constructs. A monastery of the heart, though, provides an unlimited ministry. Our commitment to Christ, to those who we share our journey, and to the distinct Holy Rule of Life we follow are essential elements of the Order's monastic "walls". In addition, work strengthens our walls. A life balanced between work and prayer; hard work, honest work is an outward expression of our thanks to God for the necessities of life that he has provided. Prayer fortifies our walls and opens the doors to heaven. Prayer is the way in which we enter into dialogue with the Divine and open ourselves to revelation. Sacrifice consecrates our walls. Sacrifice, the willingness to give unstintingly of ourselves, opens us to a deeper understanding of and companionship with Christ, who gave all that our earthly journey need not be a solitary one. Sacrifice also opens the way to companionship with our fellows and thus provides us with a deeper experience of our humanness and the humanness of others. No longer bound by monastery walls, the Lord's service is exercised by the Community in the world, in God's creation. Therefore our Order is established as an "urban abbey" or "monastery without walls" in that most of our members hold secular jobs and live out in the world, either alone or with family or friends. "Our Lady of Peace Archabbey" is the official residence of our founder and current Presiding Archbishop-Abbot. Each member's home also serves as their own urban abbey and they are encouraged to name their abbey appropriately. Our Order is generally a non-residential religious order, which means that our Monks and Associates do not all live in a cloistered setting. The Brothers and Sisters of the Order of the Most Holy Mary Theotokos (whether lay, religious, or ordained) do not need to give up their jobs, or move away from their homes, friends, and families, to belong to the Order. Our spirituality permits us to grow through the experience of living in the middle ground between monastic life and the secular world. Our Monks and Associates remain self-supporting and live, work, and perform their individual charism within their own hometown communities surrounded by their friends and family. However, when there are members of the Community living in the same geographical area, they are encouraged to come together as often as possible for community prayer and Mass. We are lay or ordained, married or single. Our community is ecumenical and our members come from a diversity of Christian backgrounds. Thus, while remaining true to our Catholic tradition, our Order blends the rich, yet diverse, Christian traditions to form a unique approach to monastic spirituality. We are men and women, who live and work together in a common journey of faith and service. As a new religious community we are building a new monastic family, and are seeking people who desire a deeper relationship with God and humanity through a life of prayer, fraternity, and devoted service to Jesus Christ through dedication to the Blessed Virgin Mary, the Mother of God. The Order of the Most Holy Mary Theotokos is a community separated by distance but united by prayer, and common bonds of devotion to our Lord Jesus Christ formed by the work and witness of the Blessed Virgin Mary. Our Way of Life: We are a Benedictine contemplative order, called to a life of prayer, who seeks to live the Gospel life fervently in the Church and the world. We witness to a contemporary interpretation of traditional monasticism, open to the leading of the Holy Spirit as we proclaim the good news of the cross of Christ. 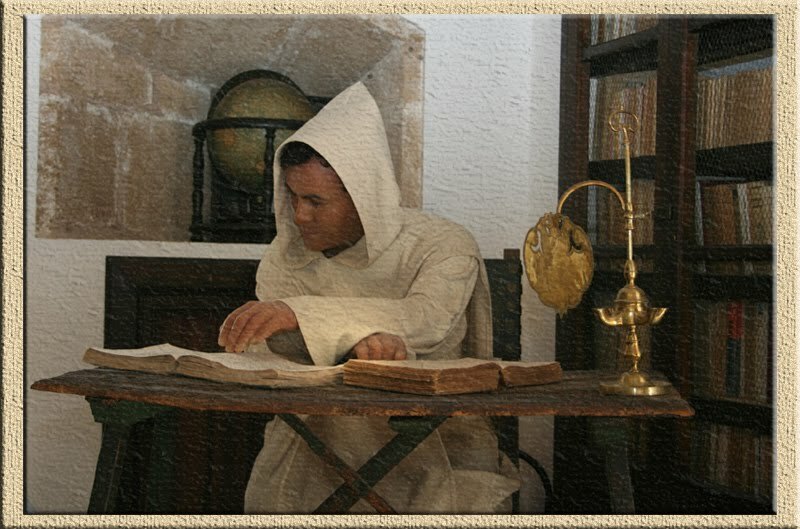 Our mission is shared by a First Order of vowed Monks and a Third Order Secular of dedicated Associates. While the traditional ideal of an "Order" in the monastic sense separated members from the world to develop and serve a specific community of religious, the O.SS.T. member values and uses his/her life in the world to develop, along with the Savior Jesus Christ, the kingdom of God on earth. The goal of members of the Order of the Most Holy Mary Theotokos is to bring "all things together in Christ" and with Christ to build this world brick by brick – so to speak, until Christ takes what we together have built and raises it up to the Almighty Father as the best fruits of our labor. "Benedictines of Mary, The Old Catholic Marianists"
...striving to follow Christ in the loving simplicity of our Holy Virgin Mary. Give yourself wholly to Christ! ...where everyday people can live a religious life in the world!